Flower girl dresses haven’t changed all that much over the years and the majority of brides choose a dress similar to their own, to create an adorable mini version. This is a really lovely idea but we always consider the child’s comfort. How the child feels in their outfit will change the course of her role, so it is important to get it right. 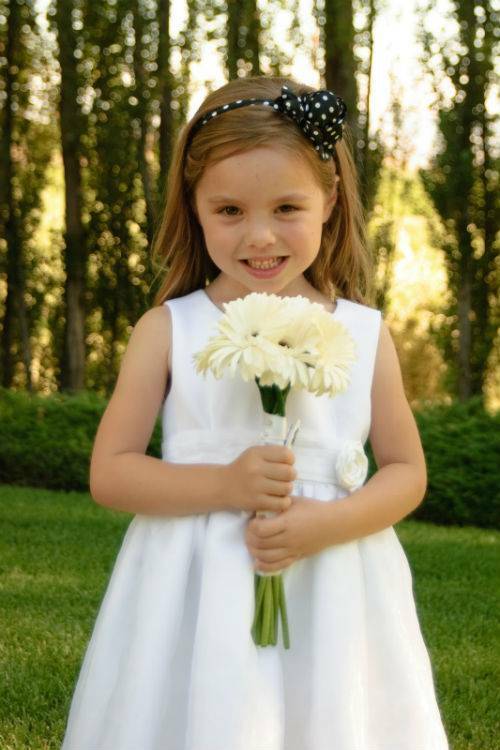 We have a range of flowergirl dresses for girls aged up to 13 years. Our aim is to make sure every little girl is looking her best on your wedding day. Being a flower girl is a very special role, and your flowergirls will impress all your guests in one of our beautiful dresses. We have a range of colours and styles to suit your flowergirls and make them look amazing for your special day. There are a lot of different styles out there including traditional or more modern. With styles to suit every colour scheme, our beautiful dresses will make your special day and create those picture-perfect moments. Let's get your amazing bridal team into their dresses and looking amazing. We have a wide variety of dresses for your best ladies to choose from.